The Berkeleyside news site highlighted a new music video today (below) by DJ Dave (David Wittman (creator of the “Whole Foods Parking Lot” video, and the “Berkeley Enough” video). David Wittman's company is called Fog and Smog a "creative collective of culture vultures from the SF Bay Area and Los Angeles." Check out their YouTube channel - great, funny stuff! This video reminds me of another hip hop parenting video, Swagger Wagon, strangely enough by Toyota, featuring the "Sierra parents" to promote the coolness of the Toyota Sierra minivan. This "genre" of mommy/daddy rap is new to me, but it makes sense. The history of hip hop music tells us that "hip-hop's roots can be found in a variety of African-influenced musical styles... gospel, folk, blues, jazz and R&B music ... calypso, salsa, soca, ska, reggae and other Afro-Caribbean styles." Kool Herc (Clive Campbell) and Grandmaster Flash (Joseph Saddler) were among the first DJs to use turn-tabling in the 1970s and early 1980s. Then, in the 1980s, "modern" hip hop really took off, with artists like Run–D.M.C., Public Enemy, and the Beastie Boys. Later, in the early 1990s, gangsta rap took hold - artists like Dr. Dre and Snoop (Doggy) Dogg. So, if you were a slightly dorky teenager in the late 1980s, hip hop was cool. You may have spent your college years listening to 2 Live Crew, Biz Markie, DJ Jazzy Jeff & The Fresh Prince and Naughty by Nature. Now, almost 25 years later, you would be nearing 40 and likely a parent with young kids. Hence mommy / daddy rap has found their market! Fitting this age demographic myself, I must say I find both videos hilarious. DISCLAIMER TO MY STUDENTS: I am in NO WAY endorsing this activity, or encouraging you to try it. I just think it's one of the craziest things I've ever seen, and I encourage you to WATCH and not DO this. Well, I expend enough vigilant energy biking up the SF hills and down Market St. during commute hours, but these guys take urban biking to a level I never knew existed. One of the newer guys on the block is Andrew Dickey from Melbourne, Australia. Dickey made an earlier video, called Art of Bike, where he takes the viewer on "a bicycle tour of Melbourne's cultural icons." It's pretty cool. I guess, technically, what these guys do is not called "bike parkour." In reality, it is a sport considered "bike trials," started in 1980. 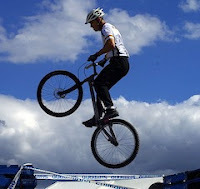 Bike trials is an individual sport that incorporates the use of a special bicycle which the rider must maneuver and balance on in order to complete specially designed artificial or natural "sections." The objective is to pass through the sections with as little physical contact with the ground as possible, hence obtaining minimum penalty points. Bike Trials comes from Motorcycle Trials. Motorcycle trials riders wanted to give their kids something to practice on before moving up to motorcycles, and some of the kids grew up to love bike trials more. Finally, MacAskill recommends "Some good tricks to start off with include the manual, track stand, wheelie, skid, stoppie and bunny hop. " No thanks, I think I'll just watch. I got to play with bioluminescence this weekend! Some friends invited me out on a short kayak trip and we able to experience the magical glowing water firsthand! But, of course, it wasn't magic... it was science! Bioluminescence is the production and emission of light by a living organism. The name comes from the Greek word bios for “living” and the Latin word lumen for “light.” So, put it together and you have “living lights"! Animals most often use bioluminescence to communicate with each other, to find mates, to catch prey or to defend themselves. You may be most familiar with bioluminescence from fireflies - though other organisms can produce it, including squid, deep-sea fish, some bacteria and even mushrooms! 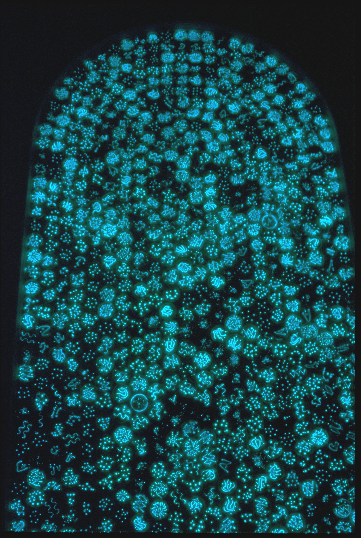 However, dinoflagellates (single-celled protists) are the most common source of bioluminescence. I have also had the opportunity to see some bioluminescent organisms at the Marin Headlands - Noctiluca scintillans in the sand! In the daylight, we saw pelicans, sea jellies, seals, and even a bat ray! By 9:30 pm, the light show had begun. Along the edges, where the water met the sand, you could see little glowing spots. Once we pushed off in the kayaks, we could see an eerie glow emanating from the bow of each boats as it moved through the water. Paddling created swirling, glowing eddies. Fish, as stated above, made themselves known by the glowing streaks they left in the wave of their movements. And, perhaps most fun of all, dangling your fingers over the edge of the boat created all sorts of glowing patterns... splashing made a liquid fireworks display! According to the Vieques site, the best time to observe the bioluminesence aligns with particular phases of the moon, between full and new moon, to be exact. Other sites are more vague, for example, "bioluminescence is only present for a couple of months a year when the variables all align: water temperature, air temperature, winds, currents, and tides." However, the moon phase connection makes sense. You want it to be very dark with little to no moonlight. Yesterday, on August 11, the Moon rose at 12:57 am and set at 3:47 pm, leaving our ideal viewing time (around 9 - 10 pm) without any moonlight. The Moon's phase was waning crescent, partway between a 3rd quarter (moon rise at midnight, moonset at noon) and new moon (moonrise at sunrise, moonset at sunset). My roommate and I also discussed the fact that it may have to do with the wind. She says it is much foggier lately because of the cold upwelling (read more if you are interested). This same upwelling brings nutrients to the surface, providing good conditions for dinoflagellate population growth. And according to this sobering article about the effect of climate change on coastal ecosystems, the most intensive upwelling occurs in Tomales Bay during the summer, "in response to strong, often persistent northwesterly winds." This also aligns with the dates the bioluminescence is best viewed. What's making all the glow? Dinoflagellates are planktonic - 90% of all dinoflagellates are marine plankton. Dinoflagellates are small. - many of them are microscopic and range from 15 to 40 microns in size, the largest, Noctiluca, may be as large as 2 mm in diameter! Dinoflagellates are motile - dinoflagellates swim by means of two flagella… as a result of the action of the two flagella the cell spirals as it moves. Many dinoflagellates are photosynthetic, manufacturing their own food using the energy from sunlight, and providing a food source for other organisms. The photosynthetic dinoflagellates are important primary producers in coastal waters. Some photosynthetic dinoflagellates are symbiotic, living in the cells of their hosts, such as corals. Called zooxanthellae, they are found in many marine invertebrates, including sponges, corals, jellyfish, and flatworms, as well as within protists, such as ciliates, foraminiferans, and colonial radiolarians. Approximately half of all species are heterotrophic, eating other plankton, and sometimes each other, by snaring or stinging their prey. 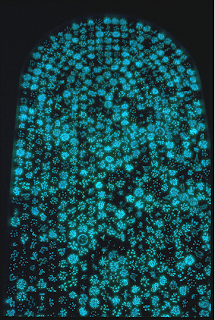 Non-photosynthetic species of dinoflagellates feed on diatoms or other protists (including other dinoflagellates); Noctiluca is large enough to eat zooplankton and fish eggs. Some species are parasites on algae, zooplankton, fish or other organisms. Dinoflagellates usually reproduce asexually - the most form of reproduction is asexual, where daughter cells form by simple mitosis and division of the cell. The daughter cells will be genetically identical to that of the original cell. The most common trigger for dinoflagellates glow is mechanical stimulation, like the disturbance of a boat, paddle, swimmer, fish, or our fingers! Apparently, they can react to chemical stimulation as well - reducing the pH of their environment can cause some dinoflagellates to glow continuously (source). The most common theory on why these organisms bioluminescence is that the reaction acts as a type of "burglar alarm" defense mechanism. When the dinoflagellate is disturbed, it is likely it is going to get eaten (most often by a shrimp). So it sends out a brief flash, which may distract the predator, or attract a secondary predator that might eat the predator that is trying to eat the dinoflagellate. Or, perhaps the dinoflagellate will get eaten anyway, but by attracting a secondary predator to eat the first predator, the dinoflagellate is saving the rest of its protist buddies from being eaten. 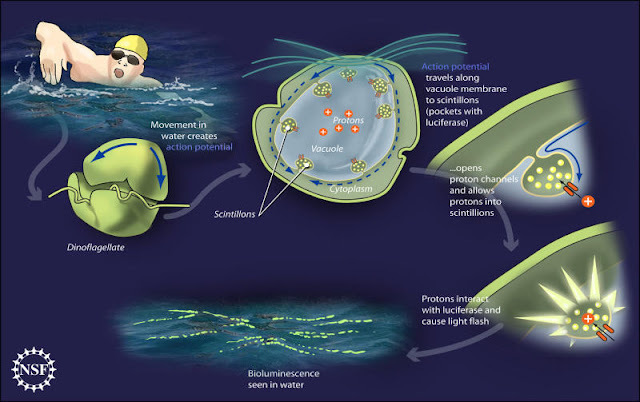 LONG VERSION: According to some studies, including this one, here is the general idea of how this reaction goes down: Inside the cells, luciferin is packed in vesicles called scintillons. This luciferin is produced throughout daylight hours. The luciferin is usually bound to a protein called a Luciferin Binding Protein or LBP. At a neutral pH, LBP stabilizes the luciferin from being spontaneously oxidized. When movement of surrounding water bends the cell membrane, it sends electrical impulses around the vacuole - which holds a bunch of protons (why? I don't know). These electrical impulses open proton channels, and those protons can now move from the vacuole into the cytoplasm (where the scintillons are kept). The cytoplasm becomes acidified, and the process is activated in the scintillons. When the pH drops to around 6, the luciferin and the LBP dissociate. In the process of being oxidized, luciferin briefly exists in an excited state, after which it decays to the ground state- releasing energy in the form of light. The oxidation of the luciferin by the luciferase results in inactive oxyluciferin. This reaction can happen more than once, but once the luciferin is used up, that dinoflagellate is done for the night, until it can replenish its supplies the next day. Can I get some dinoflagellates and make them glow? That is about as cool as that giant petri dish Contagion billboard! UPDATE 8.21.13: Yonder Biology started a Kickstarter campaign to create a Dino Pet, a "dinosaur-shaped habitat for a species of bioluminescent marine algae that photosynthesizes during the day and glows at night." Hilarious! [His] current work with honeybees creating sculptures in their hives is an example — [He'll] introduce blown glass objects into beehives that the bees will encase in honey comb patterns; these, in turn, become [his] sculptures. Hermit crabs (Kingdom: Animalia, Phylum: Arthropoda, Subphylum: Crustacea, Class: Malacostraca, Order: Decapoda) belong to six families containing around 1100 species in total in 120 genera. Unlike regular crabs, hermit crabs have a soft abdomen, so they need to inhabit abandoned shells for protection. (that's where their name "hermit" comes from ... "one who lives alone") Anyway, when they outgrow their shells, they need to leave and find a new, bigger shell to inhabit. 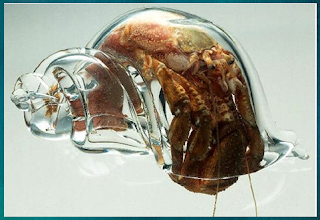 Usually, they find snail shells, but hermit crabs have been known to inhabit broken bottles, and maybe even a teacup?! Personally, I have a grudge against hermit crabs stemming back from 3rd grade. Upon returning from a field trip, I was tasked to feed the class pet. It clamped on the soft flesh of my inner finger and would not let go. My helpful peers and teachers did things like tap it, run it underwater, etc... while my 3rd grade self was convinced it would never come off. Finally, it did, leaving me with a wicked blood blister. Needless to say, I've been wary ever since. :) But I do enjoy these glass shells as art! Emart, one of the largest retailers in Korea, noticed that their sales slumped during the lunch hour each day, and they came up with a pretty darn innovative way to change this midday trend. Their "Sunny Sale" solution was brilliant! The company placed 3D QR codes across the city which could only be scanned between 12pm and 1 pm each day, when the sunlight cast the shadows correctly to complete the QR code. Once the code was scanned, customers would be rewarded with special offers that could be used in the store or online. Wow! If you want to know more specifics on QR codes work, see my previous post on QR codes. Seriously, what an amazing idea! Check out the video below. So, this is pretty crazy. Apparently, a condo association in Palm Beach, Florida is requiring that residents pay $200 fee and the money will pay DNA Pet World Registry to take the dog's genetic fingerprint to be kept the information on file. Why? I'm so glad you asked. To protect them from dog-nappers? For research purposes? Nope. The DNA profile will be kept on file so that unclaimed dog poop left on the property can be collected, sent to DNA Pet World, profiled, matched to the offending dog. The negligent owner will then be required to pay a fine of up to $1,000. According to the article, "Feces identification is a booming business. DNA Pet World and PooPrints - its motto is "Match the Mess through DNA" - are spinoffs from BioPet Vet Labs." It's totally worth taking the time to check out the PooPrints site. Hilarious.